Marine Le Pen outraged after being ordered to undergo psychiatric tests for tweeting pictures of atrocities committed by ISIS. French far-right leader Marine Le Pen expressed outrage on Thursday after being ordered to undergo psychiatric tests for tweeting pictures of atrocities committed by the Islamic State (ISIS) group, AFP reported. Le Pen shared the gruesome images in December 2015, a few weeks after ISIS jihadists killed 130 people in attacks in Paris, sparking widespread condemnation in France. The 50-year-old leader of the National Rally (formerly the National Front), who lost to Emmanuel Macron in last year's presidential election, was stripped of her parliamentary immunity over the pictures and charged with circulating violent messages that can be viewed by minors. On Thursday, she tweeted copies of a court order requiring her to undergo a psychiatric evaluation. Dated September 11, it calls for the tests to be carried out "as soon as possible" to establish whether Le Pen "is capable of understanding remarks and answering questions". "It's crazy," fumed Le Pen, who added, "I thought I had been through it all: well, no! For having condemned Daesh (ISIS) horrors in tweets, the 'justice system' is putting me through psychiatric tests! Just how far will they go?" Speaking to reporters in the halls of the National Assembly, Le Pen said she felt "persecuted" by the state and would defy the order. "Of course I won't go and submit myself to this psychiatric evaluation," she declared, according to AFP, daring the investigating magistrate to "force" her. Under French law there is no legal mechanism for forcing a person to comply with such an order. Le Pen shared the ISIS images in response to a French journalist who drew a comparison between the jihadist group and her party. One of the pictures showed the body of James Foley, an American journalist beheaded by the Sunni extremists. Another showed a man in an orange jumpsuit being run over by a tank and the third showed a Jordanian pilot being burned alive in a cage. "Daesh is this!" Le Pen wrote in a caption, using the Arabic acronym for ISIS. She later deleted the picture of Foley after a request from his family, saying she had been unaware of his identity. If convicted, she faces up to three years in prison and a fine of 75,000 euros ($87,000). In March, European Union lawmakers voted overwhelmingly to lift her EU parliamentary immunity for tweeting the ISIS pictures. Le Pen has also been charged with allegedly misusing European Parliament funds to pay two parliamentary aides who also work at her National Front headquarters. She has also faced controversy over anti-Semitism, despite her efforts to purge the party of the anti-Semitism which became its trademark under the leadership of her father Jean-Marie Le Pen. Interim party leader Jean-Francois Jalkh was forced to step down after it was discovered that he expressed skepticism about Nazi gas chambers. 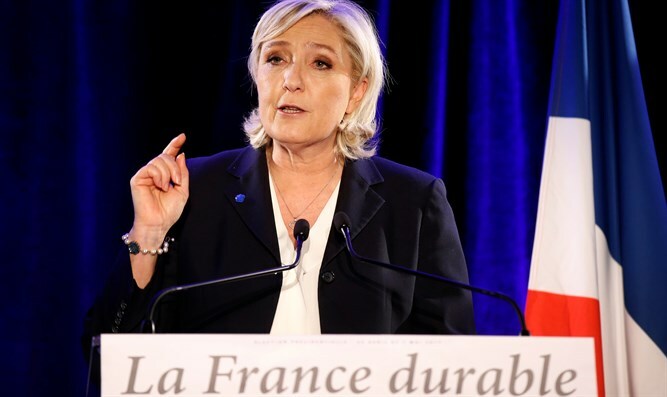 Le Pen, who made clear she “abhors” Holocaust deniers after Jalkh’s remarks were uncovered, herself drew criticism during the campaign when she said that today's France bore no responsibility for the roundup and deportation of French Jews during World War II.